How do I choose between the types of baths available? Well it really depends on requirements of the individual. 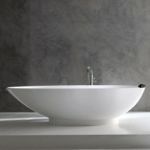 There are some people for whom baths are just a necessity, for example having a soak in the bath can reduce back pain. There are others although not a necessity love the indulgence of a relaxing soak in the bath after a stressful day. Baths can often become the focal point of a bathroom refurbishment project because of this. 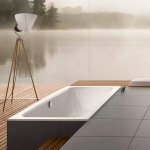 Baths in this day and age can be made from a number of materials and styles giving manufacturers incredible design opportunities. This is where our experts can help you make an informed decision depending on space, budget and requirements needed from your bath. 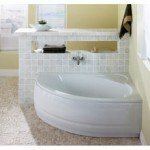 Below we will go through a few of the different types and styles of baths you can get. Clawfoot baths. As the name describes, this is a bath that stands on 4 clawed feet. 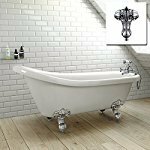 In the late 19th century these types of baths started becoming popular for the more exclusive clientele . They were very heavy as the were made of cast iron with a porcelain lining. These days they can be made from newer materials at a much lower cost. There are a number of varieties of clawfoot baths. a) Slipper baths, these have one higher sloped end so as to provide extra comfort. b) Double ended baths, these have 2 sloped ends whereas a conventional bath will only have one. c) Another variety is a pedestal bath. As the name suggests it sits on a pedestal rather than 4 clawed feet. These can be dated back to over 900 BC in Crete. Alcoved or recessed baths. These are the standard and most common bath that people are accustomed to. They can be made from acrylic, fibre glass, enamel coated steel and in the past cast Iron. As a rule these types of baths are installed against 2 or 3 walls and you often find a shower over them. Drop in Baths. A drop in bath is as the name again suggests one that you just drop in to. The bath itself can be dropped in to a cavity or recess in to the floor or a raised platform can be built and the bath dropped in. This will give the bath a flush finish and make it very pleasing to the eye. The downside can be though with some designs they can prove to be awkward to get out of! Another type of drop in bath is commonly known as the overflow bath. This is name so as it has a guttering going all the way around the bath. This enable you to fill the bath up to the rim. All the water that overflows is then circulated back in to the bath. This can create a stunning visual effect. Freestanding baths. 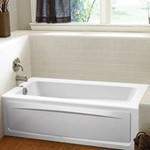 This type of bath basically doesn’t connect to any walls, technically pedestal and clawfoot baths fit in to this category. The thing is that modern day designers have pounced on the concept in recent year developing a large variety of unique design shapes using a various themes in a range of different materials. These can be very different and can suit different tastes. Corner baths. These triangular shaped baths are generally installed where space is at a premium. They fit in to the corner like a wedge. They are great for premises where a standard bath would take up too much room. They can be “souped-up” with jets converting them in to a mini Jacuzzi. Whirpool baths or Jacuzzi’s. My favorite! These are relatively new to the market place, 1968 in fact. Although people use the term Jacuzzi commonly instead of whirpool bath many do not realize it is actually a brand name. The original inventor was called Candido Jacuzzi (actually pronounced Yah-Koot-See). These types of baths are built with opening located in the sides of the bath. These opening house water jets which stream air bubbles. This gives the bather a soothing and relaxing sensation. They are often attributed to providing health benefits such as improved circulation. 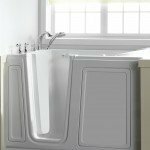 Other types of whirpool baths are spas and hot tubs. Walk in or gated baths. 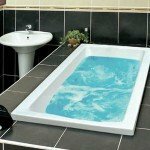 These types of baths are generally installed for disabled or elderly people who struggle with movement. These types of baths are built up vertically with high walls and a seat. This enables the user to open a door and walk directly in without having to climb of the edge of the bath and lower themselves in. Once in they close the door and fill the bath with the desired amount of water. For a new bath or advice on the types of baths that may suit your needs call the experts at bathroom refurbishments Dublin on 01-6874853. Get your 10% off your new bath installation today!! !